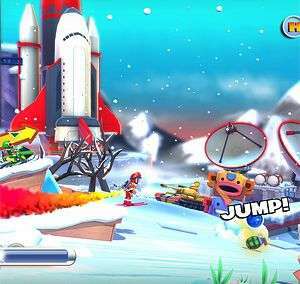 2010 saw independent developers Hello Games give the world Joe Danger on PSN; it was a side-scrolling arcade game with elements of racing and platform fun. 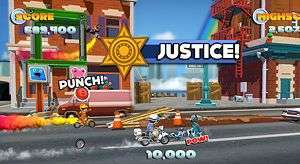 2011 saw that game expand into the XBLA format and its fame was secured. 2012 will see the release of Joe Danger: The Movie, Hello Games’ “kind of a sequel”, which aims to take the fun of the first game to the next level and beyond. Here at E3 I got a hands-on with the not-quite-finished game and I have to say, it delivers on all the things you’d expect from such a title. The action is fast paced and frantic at times in a vibrant, colourful environment, and the controls are very simple. That doesn’t mean the game itself is easy though, especially as you progress and the movie-based action scenes you’re asked to create become ever more complex. You take control of motorcycles, jeeps, skidoos, skis and even a unicycle and make your way down courses that include jumps, explosions, barriers and bouncers. During the course of your “take” (it is a movie scene after all) you can pull off tricks and boosts to up your score and increase your chances of having your stunts included in the movie. Pretty much every button on the controller is utilised in some fashion, be it to make you duck and jump, boost or balance, punch or flip. The game really is one of simplicity and ingenuity, but that should never be mistaken for being easy. There’s a definite Trials-esque feel to the ever increasing complexity of the levels and it’ll take some impressive controller skills to really get a smooth flawless run at each one, especially with explosions, falling scenery and pterodactyls getting in the way. All of this happens at a fair pace, but that’s not all you’re required to do… there are stars to collect and letters to find, all aimed at boosting your final score. Scores actively link to your friends lists so that you can see if anyone you know has got a better time or trick count than you have. This link to your friends is shown in-game, with a ghost marker showing you who has also played (something I believe you are able to switch off if you wish) and how quickly they got through the level – something that should ignite the competitive side in a lot of folk and create a good atmosphere in which to play. Online elements include four player multiplayer and also a choice of whether you want to compete or co-op, adding another dimension that other games of this type seem to have missed. Competing is simple: you race and pull tricks in an attempt to get the highest score of the run. Finishing first isn’t necessarily going to let you win either as the scoring takes into account how many tricks you’ve pulled as well as how fast you made it, and it also takes into account any falls or crashes you may have had. You can’t go too slowly either because if you fall too far behind the other players you’ll end up falling and being scooted ahead to where all the action is taking place. In co-op though, the trick apparently is to stay together at roughly the same speed and pull off the same tricks over the same jumps in synchronisation, as that will boost the group score enormously. Those scores (and all others) will then be shown on worldwide leaderboards where you’ll also be able to see all your friends’ times and scores too – something that should give you more than enough encouragement to try to beat them and claim a higher spot. One especially cool part of Joe Danger: The Movie is the inclusion of a track editor. Every single level in the game was apparently created in the included editor and the developers have gone to great pains to make it as simple and easy to use as they possibly can. After all, who really wants to spend vast amounts of time trying to work out what does what and how? Here you just choose your environment (I saw at least six different areas) and your vehicle, and the editor will then give you all the options within that environment and away you go. Picking items and obstacles and placing them is simple and once you’ve created a masterpiece you can then share it with your friends and the world. You can even collaborate with your friends to make your level as fiendish as possible and share the acclaim when Hello Games pick their five best user-made levels each week. They have also added a like/dislike system to the user content so you can choose to play only the best and most popular levels from around the world. Joe Danger: The Movie is expected to be available on XBLA some time in the Autumn and I have to say that it looks to be a lot of fun!